Prime Minister Narendra Modi released two books on the Constitution in New Delhi on Friday. 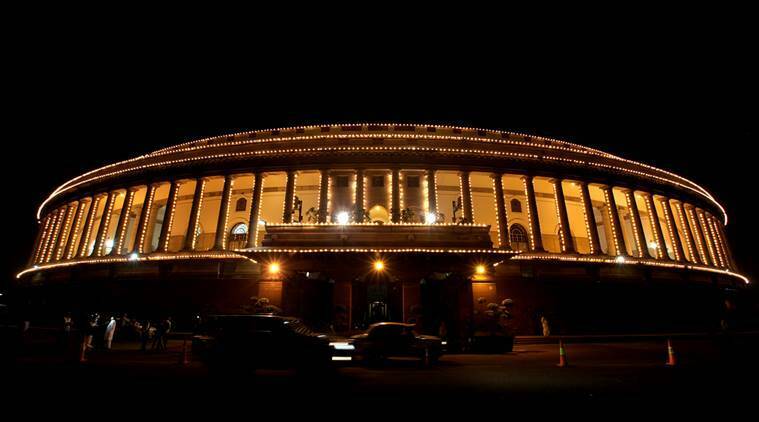 A view of Illuminated Parliament on Constitution day, during winter session of Parliament in New Delhi on Nov 27th 2015. Express photo by Ravi Kanojia. India observes its Constitution Day on Saturday, as it was on this day in 1949, the Constituent Assembly adopted the Constitution, however, it came into force a year later. The government had last year, decided to observe 26th November as Constitution Day to honour our Constitution and its promulgation. Activities like mock Parliament, essay and debate competitions are being organised across the country on the occasion. Central Board of Secondary Education (CBSE) has also asked the affiliated schools to celebrate the day. The day is celebrated to value and preserve the rich heritage of composite culture and to develop the scientific temper, humanism and the spirit of inquiry and reform. Also to promote harmony and the spirit of common brotherhood amongst all countrymen, to renounce practices derogatory to the dignity of women. Constitution Day will work as a catalyst and the day will also promote to protect and improve the natural environment including forests, lakes, rivers and wild life and to have compassion for living creatures. Prime Minister Narendra Modi released two books on the Constitution in New Delhi on Friday. Speaking on the occasion, he said it is important to connect to the spirit of the Constitution and to be aware of its various articles. He also said that though the nation celebrates Republic Day on 26th January with pride, it is incomplete without celebrating Constitution Day on 26th November.